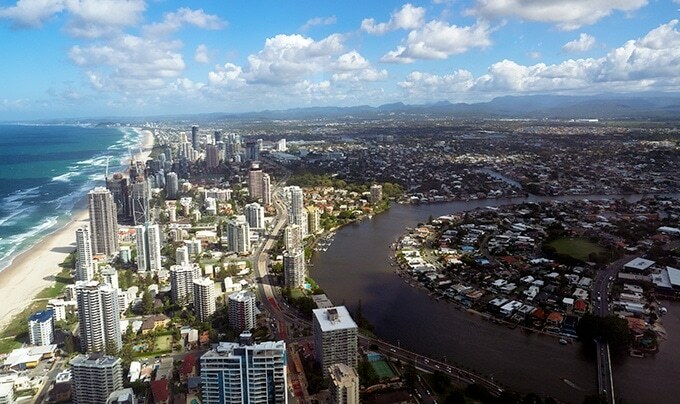 SkyPoint Bistro & Bar is located at the top of the iconic Q1 Building on the Gold Coast. 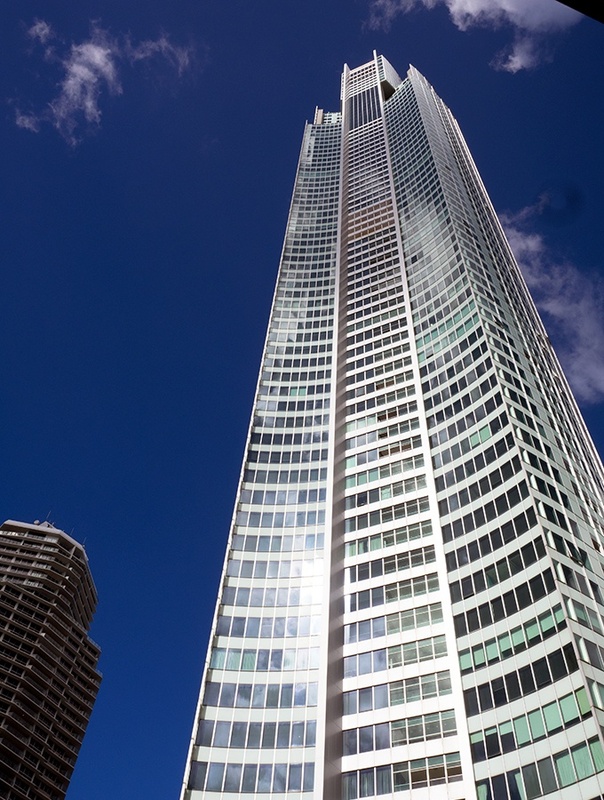 One of the World’s tallest residential towers offering spectacular 360 degree views. 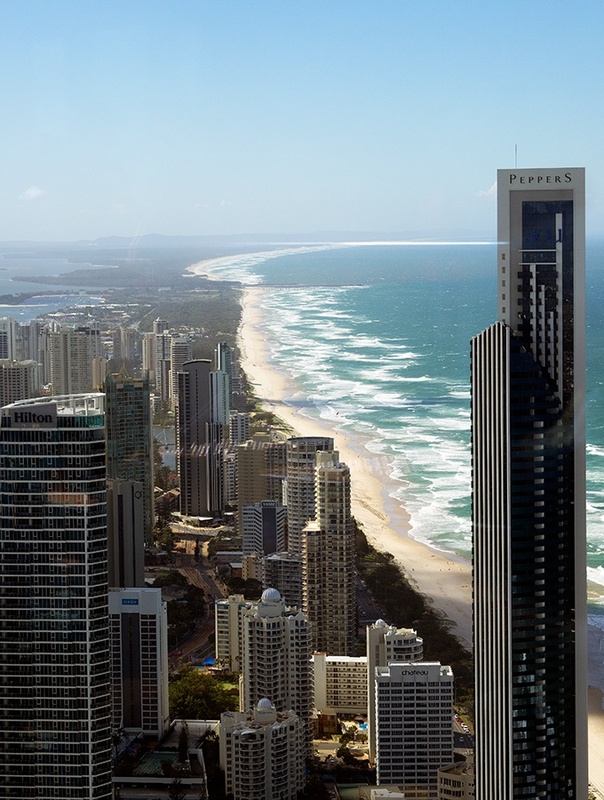 I visit the Gold Coast quite often, far more than the average Aussie. I try to fly up at least once every six weeks, my dad lives there. When visiting I generally do zero of the normal tourist activities. 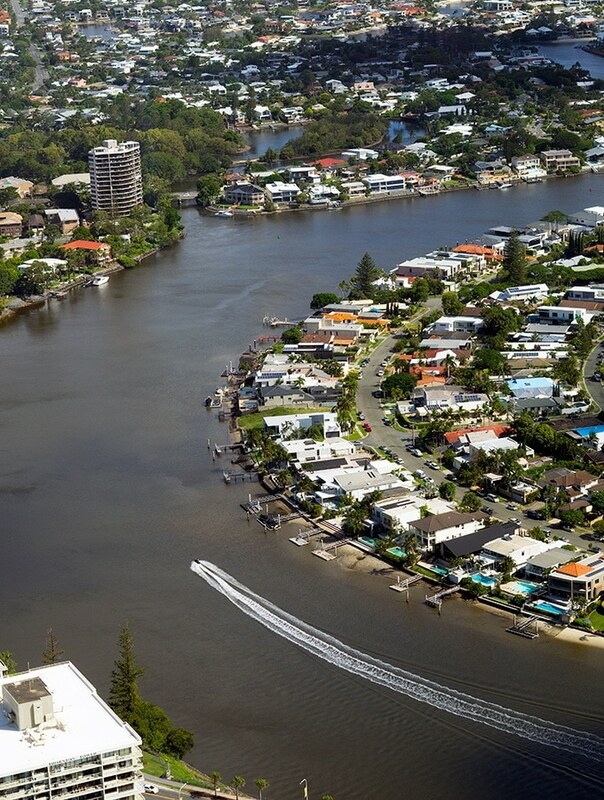 I spend time with dad, catch up with friends and do the day to day things locals do on the Gold Coast. When I was asked by SkyPoint Bistro & Bar if I would like to visit, I said yes. Located on the observation deck of one of the World’s tallest residential towers, I decided to take dad along. I was quite undecided at what time to go, a little torn. A relaxing brunch with views as far as the eye could see? 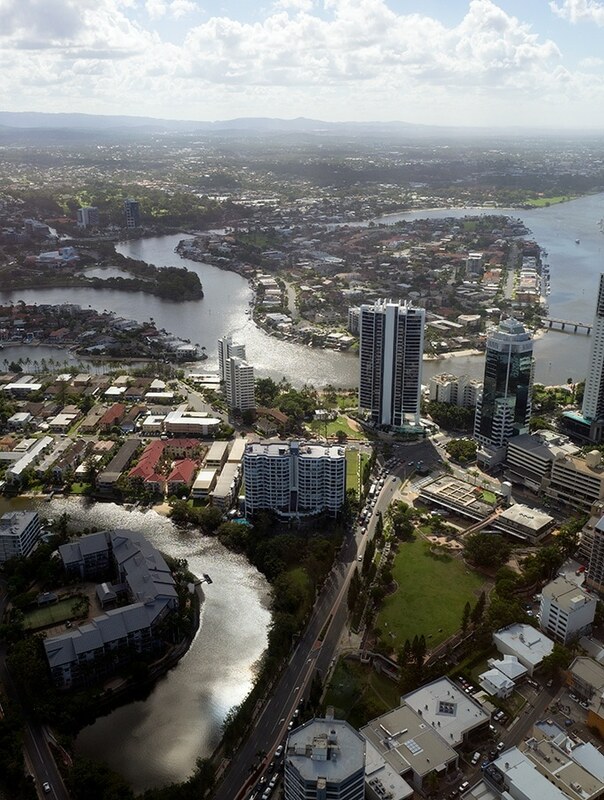 We could have had an early dinner and watched dusk roll in and the lights come on around the Gold Coast. Or head there in the evening after 8pm, when the venue becomes 18+ and the bar starts to be the focus. The decision was made for a lazy weekday lunch. Plus I wanted to check out the views in all their daytime glory. 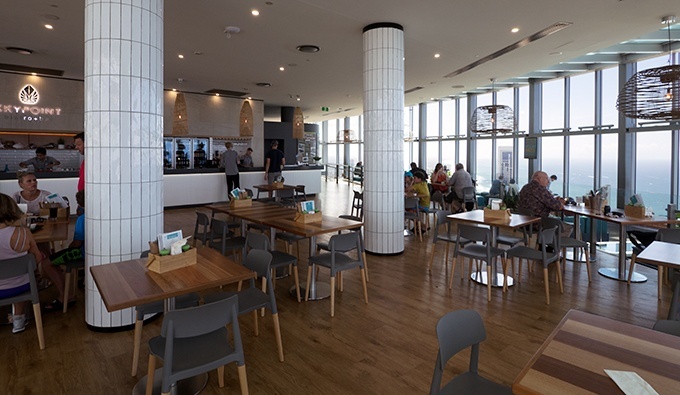 SkyPoint Bar & Bistro, along with the SkyPoint Observation Deck is located on the 77th level of the Q1 Building, Surfers Paradise. If you aren’t staying in Surfers it is easy to get to with a tram/G Link stop right out the front. 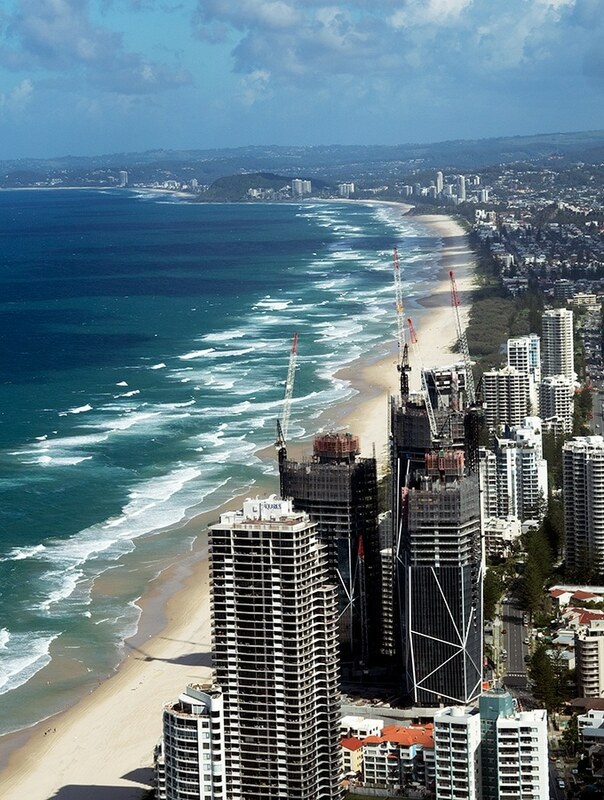 As dad lives at the other end of the Gold Coast we took advantage of bus and G/Link to get us there. That way we could partake in a very lazy lunch with some wine. It’s a quick ride in the elevator up to the 77th level. Make sure you look up as you head up! It seems these days lift rides up tall buildings always have a fun factor to them. And no, I’m not going to spoil the surprise by telling you. 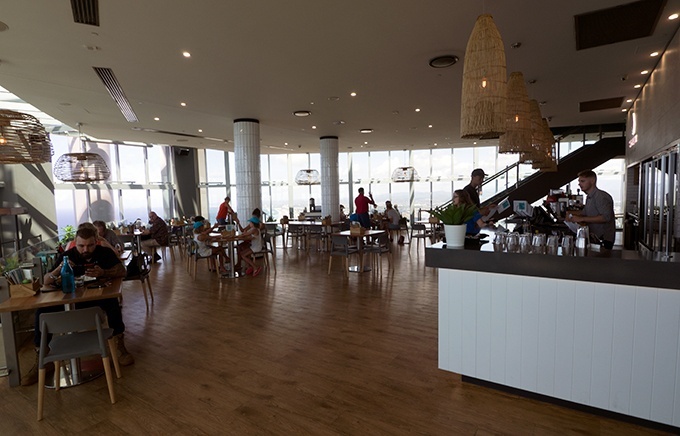 The SkyPoint Bar & Bistro décor has the typical coastal feel to it. They have used light woods, natural pale colours, which are then accentuated with aqua lounges and ottomans. 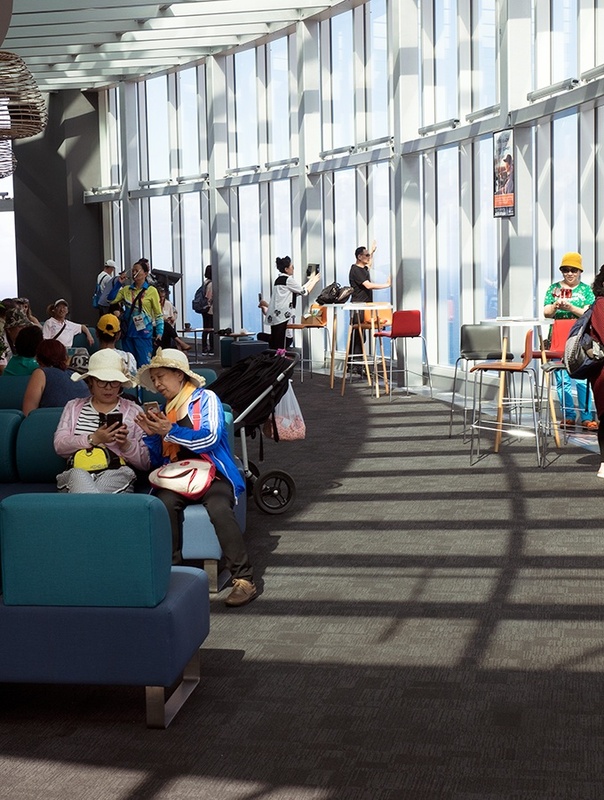 It’s a very relaxed environment, making sure not to detract from the stunning views. The menu covers all the favourites, burgers, fish & chips, pasta, schnitzel and salads. There are onion rings, wedges and fries too. 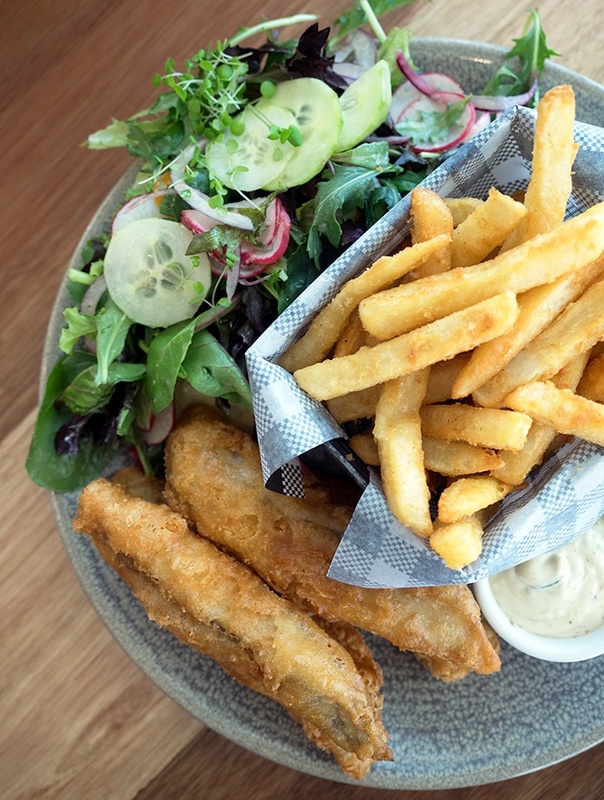 Dad ordered the beer battered Australian saltwater barramundi served with golden fries, house made tartare sauce and garden fresh salad ($24). Which I was surprised about as he is very particular about his barra. The fish was juicy and tender inside a super crisp shell of batter. The fries, oh yes the fries, beer battered crunchy love sticks. They were really good fries (served the same with my order). 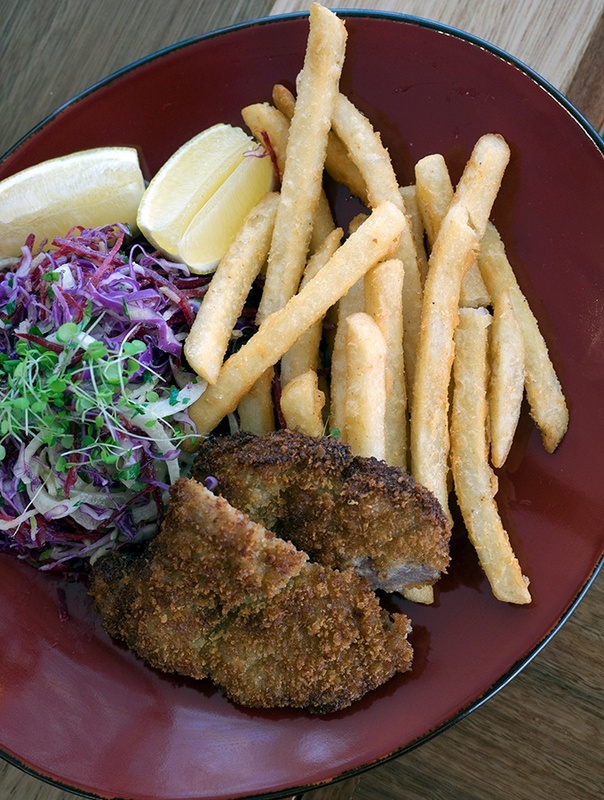 I ordered the panko crumbed pork schnitzel with apple fennel slaw and golden fries ($21). Fries, so good! Dad did get the better deal with the barra. The pork schnitzel was enjoyable but was a sadly a little tough with unfortunate fat, where fat shouldn’t have been on a schnitzel. I had to order the crispy beer battered onion rings with smoked chipotle aioli ($16) and so glad I did. 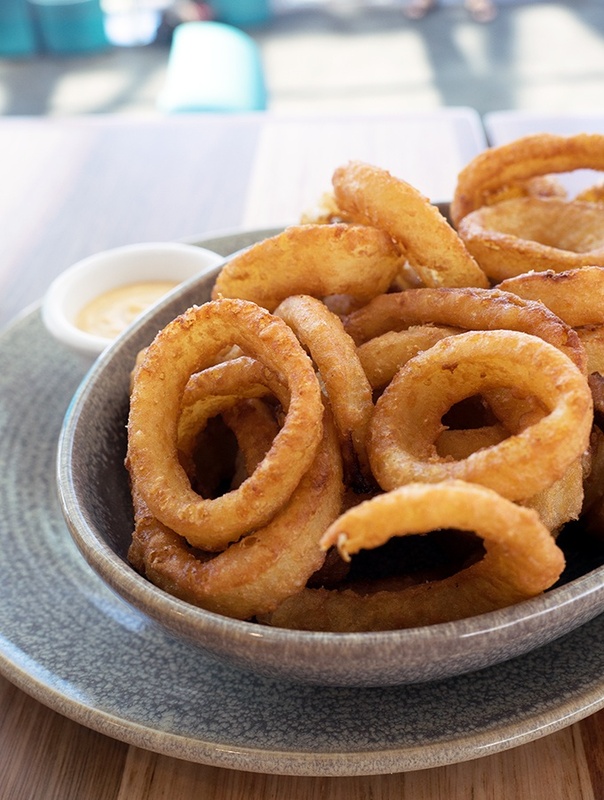 Crisp rings with tender delicious onion insides. I dare you to stop at just 10, I couldn’t stop, they are so addictive. 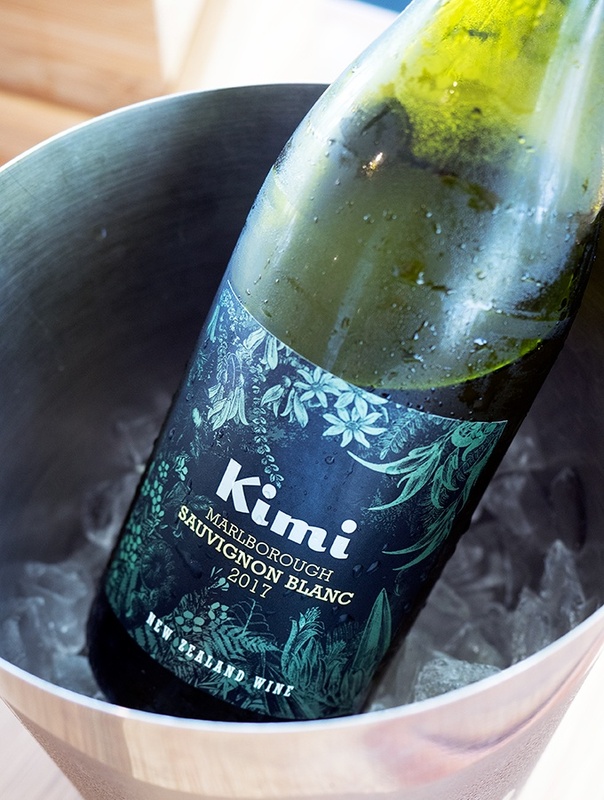 We washed it all down with a bottle of Kimi Sauvignon Blanc ($37) from New Zealand. They have some very reasonable wines considering your location on the top of the Gold Coast. They also have Witches Falls which is a QLD Sauvignon Blanc ($39) on offer. I got into trouble from dad for not ordering it as he wanted to try it (such a bad daughter). After lunch it was time to work off the food with a stroll around SkyPoint Observation Deck. The views really are quite amazing, they go on forever. 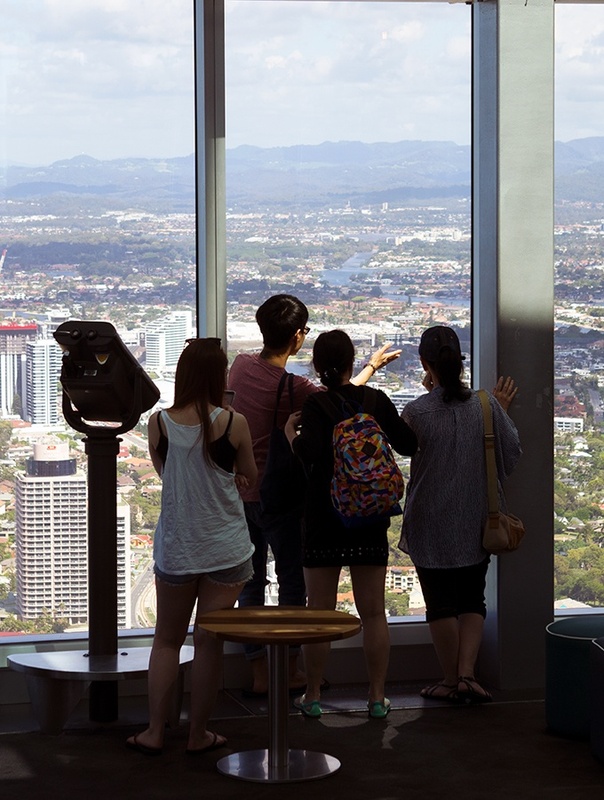 If you want to get an even higher view than the 77th floor, you could always go on a SkyPoint Climb. It’s 90 minutes of climbing all over the top of the building. I have a thing about hights and vetoed that option. But can you imagine the view! SkyPoint Bistro and Bar are really trying to cater to visitors and also locals. With live music in the evenings on the weekends and yearly access passes locals are well and truly taken care of. If you are just visiting then you will be very surprised at the food and beverage prices that have a view for miles. What else you should know: They have live music in the evenings on the weekends. Super views from the top! The food looks good too but I will be more interested in the views from such a location. I will probably take all the camera and lenses along for a good experiment. Those views, Sara. Wow! Your photos really capture the sense of scale and beauty. What a fun experience with dad. Love the sound of your dad’s barra sandwich. Yum. The onion rings look to die for as well 🙂 The wonderful Sauvignon Blanc was the perfect way to complete the experience. Skypoint bar & bistro seems like the place to be!! The food doesn’t look so exciting, but the views are beautiful. Can you go to just have a drink and take in the views? It is just awesome. The views from the top are absolutely stunning. I like the way that have managed to let the sun in. I can imagine myself enjoying the views with beer in hand while basking in the sun! Your opening photographs is so incredible. Its something I have never seen before in person. 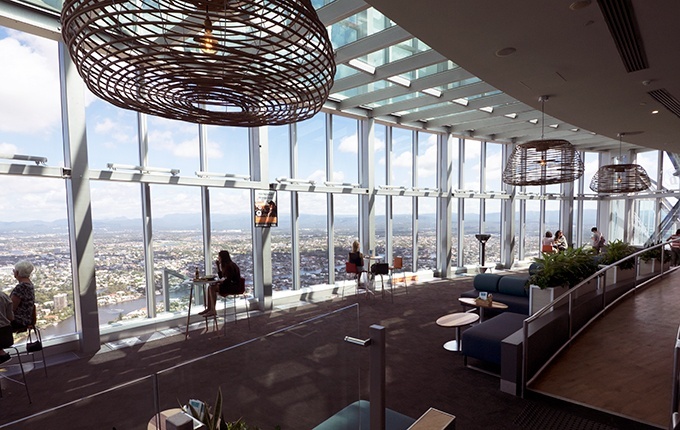 SkyPoint Bistro & Bar looks bucket list worthy indeed. You took the right decision by visiting it in day time. I am sure you had a great day with your dad and enjoyed delicious food too. Okay, the food all looks absolutely delicious. The panko pork schnitzel with those golden fries!!! Looks so good. I would absolutely love to venture here for an amazing meal! And the views are spectacular! I’m not a huge fan of the Gold Coast but those onion rings make so tempted to get on a plane. I do love the idea of eating so high up. Almost as much fun as flying and eating but better food! That view and food look absolutely incredible! Were you afraid of how high it was!!? Beer battered Australian saltwater barramundi souonds good too with a nice white wine…winning! Sounds like a perfect combination: great food AND a stunning view. I would LOVE to eat at SkyPoint Bar & Bistro. 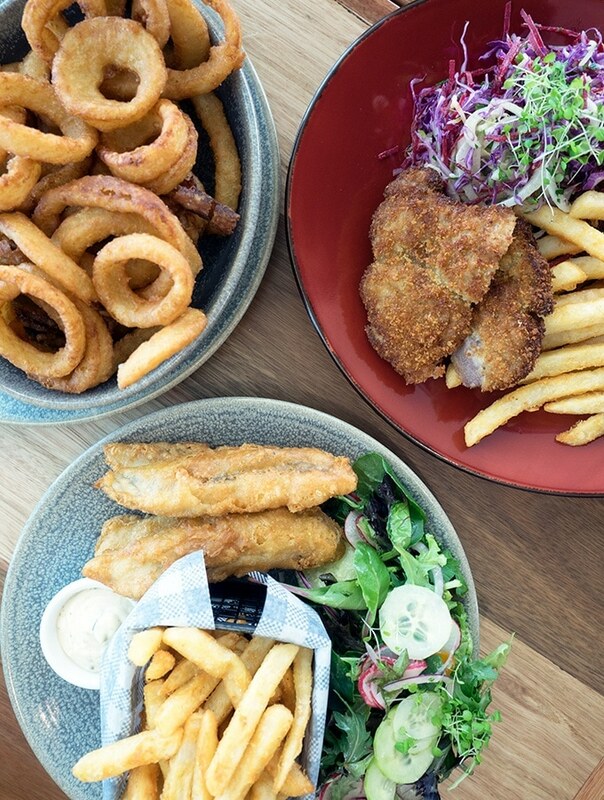 Your dad’s barramundi and some of those beer battered onion rings sound outstanding. I’m just going to have to appreciate this one from your photos as anything over 3 floors and I get vertigo. But that view is immense, and your photos really capture it.